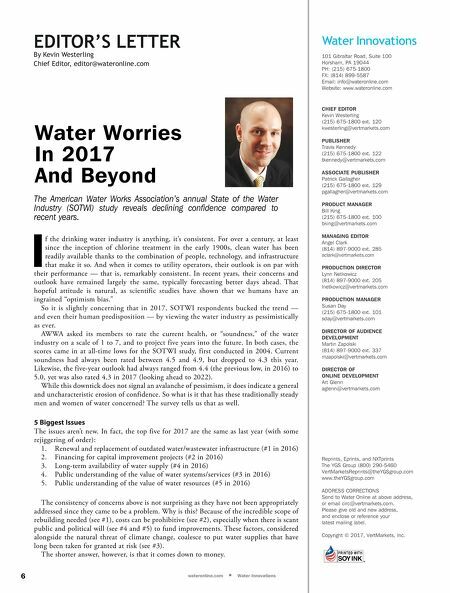 wateronline.com n Water Innovations Water Worries In 2017 And Beyond EDITOR'S LETTER By Kevin Westerling Chief Editor, editor@wateronline.com 6 I f the drinking water industry is anything, it's consistent. For over a century, at least since the inception of chlorine treatment in the early 1900s, clean water has been readily available thanks to the combination of people, technology, and infrastructure that make it so. And when it comes to utility operators, their outlook is on par with their performance — that is, remarkably consistent. In recent years, their concerns and outlook have remained largely the same, typically forecasting better days ahead. That hopeful attitude is natural, as scientific studies have shown that we humans have an ingrained "optimism bias." So it is slightly concerning that in 2017, SOTWI respondents bucked the trend — and even their human predisposition — by viewing the water industry as pessimistically as ever. AWWA asked its members to rate the current health, or "soundness," of the water industry on a scale of 1 to 7, and to project five years into the future. In both cases, the scores came in at all-time lows for the SOTWI study, first conducted in 2004. Current soundness had always been rated between 4.5 and 4.9, but dropped to 4.3 this year. Likewise, the five-year outlook had always ranged from 4.4 (the previous low, in 2016) to 5.0, yet was also rated 4.3 in 2017 (looking ahead to 2022). While this downtick does not signal an avalanche of pessimism, it does indicate a general and uncharacteristic erosion of confidence. So what is it that has these traditionally steady men and women of water concerned? The survey tells us that as well. 5 Biggest Issues The issues aren't new. In fact, the top five for 2017 are the same as last year (with some rejiggering of order): 1. Renewal and replacement of outdated water/wastewater infrastructure (#1 in 2016) 2. Financing for capital improvement projects (#2 in 2016) 3. Long-term availability of water supply (#4 in 2016) 4. Public understanding of the value of water systems/services (#3 in 2016) 5. Public understanding of the value of water resources (#5 in 2016) The consistency of concerns above is not surprising as they have not been appropriately addressed since they came to be a problem. Why is this? Because of the incredible scope of rebuilding needed (see #1), costs can be prohibitive (see #2), especially when there is scant public and political will (see #4 and #5) to fund improvements. These factors, considered alongside the natural threat of climate change, coalesce to put water supplies that have long been taken for granted at risk (see #3). The shorter answer, however, is that it comes down to money. The American Water Works Association's annual State of the Water Industry (SOTWI) study reveals declining confidence compared to recent years. 101 Gibraltar Road, Suite 100 Horsham, PA 19044 PH: (215) 675-1800 FX: (814) 899-5587 Email: info@wateronline.com Website: www.wateronline.com CHIEF EDITOR Kevin Westerling (215) 675-1800 ext. 120 kwesterling@vertmarkets.com PUBLISHER Travis Kennedy (215) 675-1800 ext. 122 tkennedy@vertmarkets.com ASSOCIATE PUBLISHER Patrick Gallagher (215) 675-1800 ext. 129 pgallagher@vertmarkets.com PRODUCT MANAGER Bill King (215) 675-1800 ext. 100 bking@vertmarkets.com MANAGING EDITOR Angel Clark (814) 897-9000 ext. 285 aclark@vertmarkets.com PRODUCTION DIRECTOR Lynn Netkowicz (814) 897-9000 ext. 205 lnetkowicz@vertmarkets.com PRODUCTION MANAGER Susan Day (215) 675-1800 ext. 101 sday@vertmarkets.com DIRECTOR OF AUDIENCE DEVELOPMENT Martin Zapolski (814) 897-9000 ext. 337 mzapolski@vertmarkets.com DIRECTOR OF ONLINE DEVELOPMENT Art Glenn aglenn@vertmarkets.com Reprints, Eprints, and NXTprints The YGS Group (800) 290-5460 VertMarketsReprints@theYGSgroup.com www.theYGSgroup.com ADDRESS CORRECTIONS Send to Water Online at above address, or email circ@vertmarkets.com. Please give old and new address, and enclose or reference your latest mailing label. Copyright © 2017, VertMarkets, Inc.